If most bands build a reputation or long careers out of carving a musical niche, Brooklyn's Jupiter One is brave to follow the road less travelled. In fact, versatility is their guide to delivering an element of surprise on every track. Offering proof is the group's sophomore album, Sunshower, a veritable array of styles and influences. With soaring melodies, exuberant pop choruses, analog synth-tastic sounds and shocking stage bravado, Jupiter One breathes new life into the indie rock genre. The songs comprising Sunshower?produced by the band and noted engineer Chris Ribando (The Black Crowes, Priestbird, Mary J. Blige)?blend contemporary styles with a myriad of classic influences, from Dylan and The Beatles to Pink Floyd and Fleetwood Mac to The Police and Talking Heads. But you wouldn't immediately hear them. The band has a knack for combining all of those influences into something utterly vital and wholly their own, as they've done on first single ?Flaming Arrow,? a shimmering, ringing acoustic folk tune shot through with a bumping bassline and New Orleans inspired drum groove. Sunshower dazzles on tracks like the dancefloor-friendly ?Simple Stones,? filled with handclaps and soulful economic riffing that boasts a bass line for the ages while blending ?80s Stones and MGMT. The epic opener ?Volcano? melds The Beach Boys with The Flaming Lips, while delivering one of the disc's best choruses. If Ishibashi conjures The Shins on ?Find Me a Place,? he drops vintage, finger-picking folk on disc-closer ?People in the Mountain.? As guitarist Zac Colwell puts it: ?We can sound like Simon & Garfunkel, The Kooks, or even from a webisode of Yacht Rock.? If they had their way, listeners would ingest each track on Sunshower as they would a new chapter in a never-boring book. Says singer/multi-instrumentalist K Ishibashi, ?We approach every song like, ?Will people be able to listen to this over and over again?' ? ?Each song is like a little world,? adds Colwell. ?We're the same four guys playing the music on each track, but we just like to get way down in there and explore that little world.? What K Ishibashi (lead vocals), Zac Colwell (lead guitar), Dave Heilman (drums) and Pat Dougherty (bass) have created as a result is a hook-heavy album tailor-made for our ADD times. And that mix-it-up mentality suits the band, as its songs are written by either Colwell or Ishibashi, each of whom have opposing approaches to lyric and melody. ?K leaves things a little more open for the listener,? says Colwell, who also plays keyboards and flute and adds backing vocals. ?I consciously try to have a little narrative, and tell a story.? Counters Ishibashi, who plays guitar and violin in addition to singing lead on Sunshower: ?His songs are pretty dark. I write bright, fun stuff, a lot of it stemming from one really big emotional experience. I'm more analytical, more left brain, he's more right.? ?If there's a theme to the album, it would definitely be bittersweetness,? Colwell continues. ?There's definitely some humor, playfulness, but there's also this twenty-something, we-have-to-temper-our-excitement sort of thing, especially being New Yorkers. Our elation is always checked, and some of the lyrics reflect that.? 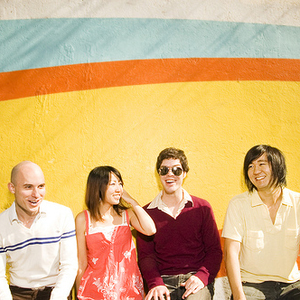 Bittersweet can be contradictory in terms, but in this case, these four unique personalities colorfully complement one another. Although officially formed in 2003, the seeds for Jupiter One were planted in 2000 when Austin native Colwell and Ishibashi (raised in Virginia) met while working as touring musicians with a traveling circus, the Barnum Kaleidoscope. Bonding over their love for all music from soul to classical Indian, the duo began performing instrumental music in New York in the early 2000s, gradually working their way toward pop music incorporating vocals, and gigs at Pianos, Arlene's Grocery and other reputable venues around Manhattan. ?We noticed that once we started singing, girls started coming to shows,? laughs Colwell. A former member of the popular STOMP performance collective, New Jersey-born drummer Heilman, caught an early incarnation of Jupiter One at a now-defunct bar in New York's Lower East Side. ?There was a unique, analog keyboard sound, something you don't really hear anymore, especially then, in 2004,? he says, ?and it just created this incredible sense of nostalgia. It made me feel like the band's music was already history. It totally felt classic, and it made me sit up on the edge of my seat.? The current incarnation of the band coalesced with the addition of Delaware-raised bassist Pat Dougherty. Taking its name from the spaceship in the ?60s television show Lost in Space, Jupiter One made its recorded debut in 2005 with a self-titled EP, three songs from which made the transition?albeit in re-recorded form?to the group's official self-titled debut album. The songs on Jupiter One scored the band a slew of high-level song-placements in TV and film projects (including the upcoming indie film Broken Windows, MLB Opening Day ?09, NASCAR Talladega Race '09 NBC's Heroes Tribute, and the Sci-Fi channel's Flash Gordon), as well as a number of video games (Madden NFL '08, NHL '08, etc. ), and commercials (Payless?09, Mazda ?08). Behind the new wave-inspired Jupiter One, the band members?having quit their day jobs?criss-crossed the States, building a fan base and surviving on Subway's five-dollar footlong special, laughs Heilman. ?We spent 14 months sluggin' it out in the clubs,? he says. ?We did not want to be some sort of boring web sensation. We wanted to meet our fans face to face.? And the work has paid off. ?It's definitely a show we've put time into, so it's not just four guys playing a song, it's supposed to be a spectacle,? says Colwell. With producer/engineer Ribando at the controls, Sunshower embraces warmer, analog sounds and vintage recording techniques. ?It's the sound of the four of us playing together, rather than layering in the studio,? says Colwell. ?Instead of piecemeal, it's the way we actually sound live.? Forgetting the sound for a minute, and thinking about the songs, Ishibashi adds: ?We just want people to internalize them. We want Sunshower to be a journey. ?